Discussion in 'Mobile Radio' started by K3WR, Oct 2, 2017. Just started the install of a dual band (VHF/UHF) radio in my 2017 Ford F-150 Platinum model. Decided to tackle getting battery power to the radio first, as I knew this could be a challenge going through the firewall of my new truck. Surprisingly, this was not as difficult as I thought it would be. Access through the firewall is accomplished by passing the positive wire through the grommet, as shown below. I used a sharp knife to poke holes on both sides of the firewall grommet. Cutting an "X" into the rubber grommet was helpful to passing the wire. WD40 helped lube the wire and it was fished through the firewall. To prevent potential damage to the positive wire, plastic wire loom was placed over the wire and was wire tied to various mounting areas in the engine compartment. Inside the cabin of the truck, the positive wire is easily accessed adjacent to the emergency brake foot pedal. As the body of the F-150 is manufactured from aluminum and the roof of this truck is all glass, mounting an antenna was a bit of a challenge. Drilling a hole for a NMO mount into the roof was a non-starter due to the all glass moon roof and magnetic mounts are not my favorite. An effective solution was a mounting bracket manufactured by Larson Electronics LLC (VMP-MAM-F150-2015-NOCAM-WHT) procured from Amazon.com. The mount attaches to the third-brake light using the OEM hardware and a few toggle bolts to align and initially stabilize the bracket until the factory screws are re-installed into the brake light. Options on this steel bracket include using a mag mount or, as I used, a NMO mount. Important Note: Due to the thickness of the antenna mounting bracket, standard-sized NMO mounts did not fit. I contacted Larson and they acknowledged that the bracket will not accommodate standard-sized NMO mounts. Quote "The bracket will not accept the standard NMO. You will need to buy the tall NMO". A NMO mount from PulseLarsen (NMO-HFMID) was used to successfully mount the antenna to the Larson antenna bracket. The coaxial cable was routed along the top of the brake light, around the top of the rear window and between the truck bed and the cab. The coax was routed through the rear of the cab through vents accessible by moving the rear seat on the passenger side forward. So far, the radio install has not required drilling of the firewall or the truck body for battery power or the antenna coaxial cable. The next steps are to mount the radio under the rear seat and install the remote head of the IC-2730 radio, which should be an easy job. Although Icom does not include a radio mounting bracket for the main radio, an after market bracket should do the job. The remote head may be a bit tricky, again, as Icom did not supply much of a mounting bracket for that either. 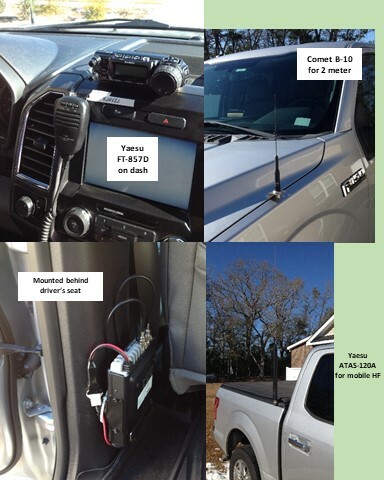 Hope this helps you Ford F-150 owners who are considering a radio install in your late model truck. The job is not that difficult and looks great. Actually, he'd want to use a 1/2 wave at VHF vs 5/8. 5/8 requires considerable ground plane. Being that's a dual band, (hopefully 1/2 wave on 2m) the UHF collinear design usually results in low VSWR on 70cm, even in mounts such as is depicted. I went for the hood mount for my VHF/UHF antenna. One bolt and it's on. There is some plastic film between the mount and aluminum body. I also used a stainless steel washer to try to minimize action between the metals. One person recommended using 100% silicon (without acid) to further minimize the galvanic action. My HF antenna is mounted using a CB stakebed mount, Because of the plastic trim, I used a copper grounding strap with stainless steel washer and screw to bond it to the bed itself. I bought one of the last steel F150s. I went with mag mounts. I heard that local contractors are not happy with the aluminum F150s as their magnetic signs don't stick. I tried the mag mount on my aluminum hood and it slid off. I wasn't planning on putting it there while moving but as a quick place to set the antenna for Parks on the Air. Thank you for posting this...I’m following your lead using the Larson third brake light mount platform to install on my Raptor. I have a question regarding the NMO-HFMID mount. It seems like all the mounts are made for 3/4” holes...and the Larson Electronic platform has 1/2” holes. How did this work for you? Did you drill them bigger? No drilling needed as the holes are sized to accommodate the width of the NMO mount. Problem is that the gauge of the metal is too thick for the standard NMO mount. You will have to use one that is longer, which tend to be a bit more expensive. I found one at a hamfest that worked well. Since I have installed the Larson mount, I have been very pleased with the performance of it. No problems at all. Looks good too. Unfortunately, I was T-boned at an intersection and the truck was hauled in for repairs. Over $12,k of damage to my aluminum body F-150. The body shop removed the bed of the truck, which afforded a look at the routing of the antenna coax through the rear cab. There are air vents in the rear cabin that can be used to route tbe cable inside without any drilling. The remote head radio is under the rear seat, so the coax cable run is fairly short.